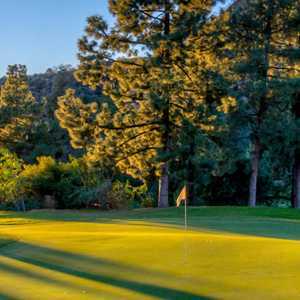 SUNLAND, Calif. -- A secluded, somewhat hidden gem for Los Angeles golfers sits like an oasis in the hot and dry, aptly-named suburb of Sunland, at the foot of Angeles National Forest. 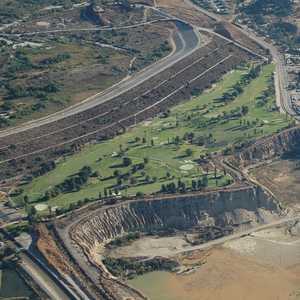 Angeles National is the only Jack Nicklaus design in Los Angeles County. Angeles National Golf Club is the only Nicklaus Design course in Los Angeles County. It is tucked away in the Angeles National Forest. This championship course is known for being one of the area's most challenging with tough greens that are lightning fast and more than 50 strategically placed bunkers. There are also two lakes and a creek that come into play. The eponymous golf course is the only Jack Nicklaus-designed layout in Los Angeles County and its proximity to several major film studios means you may see familiar faces teeing it up on the verdant track. The location works well for celebrities, said Chris Akiyama, golf operations manager for Angeles National Golf Club. "It's a pretty easy drive up from Hollywood (about 30 minutes) and the course is secluded." Akiyama said actors such as Don Cheadle and Samuel L. Jackson as well as former NFL stars Marcus Allen and Eric Dickerson play the course frequently. He noted Green Bay quarterback Aaron Rodgers recently played a round there, but 70 percent of play is Joe Public teeing it up with friends or business associates. While the remote layout provides solitude, the quality of the golf course also comes into play. Opened in 2004, Angeles National offers a stiff challenge, playing 7,141 yards from the tips, with a course rating of 74.7 and a slope of 143. It rewards accurate shots more than long strikes, with fairway bunkers and other hazards penalizing well-struck balls that drift, are blown by the often strong winds or roll farther than expected given the dry and relatively flat ground. "Fairway shots run downhill, and run far on this dry course," Akiyama said. "You have to hit it really straight in play off the tee. You don't need driver on all holes. No. 6 is one you may not want to play driver (off the tee)." The sixth hole, like so many others, has a forced carry from the black tees into the wind, which definitely comes into play on the course. The green severely slopes left, so as the GPS flyover will instruct you, aim for the center right over the bunker. Akiyama helped with the recorded instructions on the carts and said newcomers especially should heed the warnings given the steep slopes around the green. The Angeles National manager is hard pressed to pick favorite holes but favors the difficult 220-yard carry from the tee on no. 2 and the 490-yard par 4 back into the clubhouse on no. 9. A few notes about the Angeles National: "It's different from other L.A. golf courses -- it's not tree-lined," Akiyama said, contrasting the arid course with rival layouts. It also features wood chips separating some of the fairways and in other places; relief is given with free drops -- no nearer the hole, of course. Areas marked as environmentally protected zones are played as a lateral hazard. As the starter will tell you, entry into these habitats is grounds for removal from the course. There are drop zones on the other side of the arroyo on several holes in case you fail to clear the brush off the tee. Spend some time on one of the putting greens. They are fast and are helpful to practice the subtle breaks. Keep in mind putts break off the mountain towards the wash area. The course features a large, open driving range, chipping and putting greens as well as a private instruction area where the four instructors work with students. "We have probably the best practice area in L.A.," Akiyama said. And some area players say it's a favorite layout. "It's the best course we have access to living in (Los Angeles)," Casey Lane, who played to a 3.15 handicap, said after a recent round. "It's easy to get to from the Beverly Hills, West Hollywood area." The avid golfer and Los Angeles restaurateur lives and works near those locations and frequently plays Angeles National. "Angeles has consistently fast, true-rolling greens and a layout that never bores the better players," Lane said. Robert Gray is a freelance journalist now based on the West Coast after covering Wall St., the economy, and the business of sports among other things for Fox Business and Bloomberg TV in New York. Prior to that, he covered sports, news and entertainment for various media in Washington, D.C. and Prague. Follow Robert on Twitter at @robertdgray.